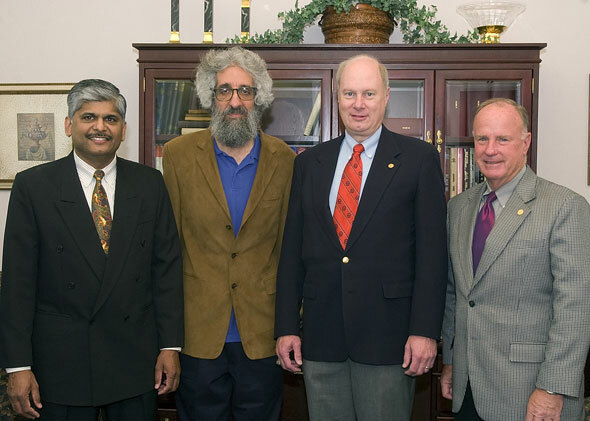 Faculty Excellence Award winners for 2008 include (from left) Balasundram Maniam, Barry Friedman and Victor Sower, with SHSU president Jim Gaertner. Two business professors, who join an elite group multiple honorees, and a physicist have been recognized for their teaching, service and research skills as the 2008 Faculty Excellence Award winners. Awarded a $5,000 prize each are Balasundram Maniam, Excellence in Teaching recipient; Barry Friedman, Excellence in Research recipient; and Victor Sower, Excellence in Service recipient. 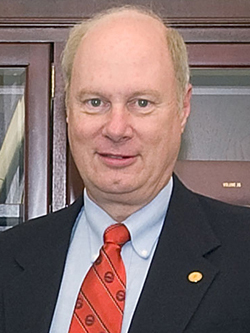 "We're only as good as our faculty," said SHSU president Jim Gaertner. "We're a wonderful university, and it's because of people like you." “Inspirational,” “enthusiastic,” “dedicated,” “passionate,” and “approachable.” These are among the many adjectives that more than 48 colleagues, students and alumni used to describe Balasundram Maniam, the 2008 Excellence in Teaching award winner. “The ultimate professor,” according to one student, Maniam is the fifth to be awarded more than one Faculty Excellence Award. 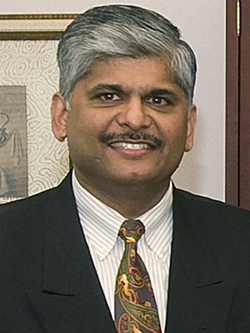 He received the Excellence in Research award in 2003. Maniam’s enthusiasm for the field has also been known to spread to his students. Said to exemplify the university marketing phrase “up close and personal," his care for his students does not end in the classroom, as many alumni reported keeping in touch with him after graduation. “One memory I have of him was when my father got very ill, and he did not let me drop out of class. His willingness and patience to work with me really stood out in my mind,” one alumna said. “Obviously, he did not have to take the time to help me through this rough patch, but he did. In the past 10 years, physics professor Barry Friedman has received almost a half million dollars in grants, including five from the National Science Foundation and the Texas Higher Education Coordinating Board’s Advanced Research Program. Two of his studies on superconductivity and the electronic properties of organic materials have been cited by others in the field at least 170 times, according to Google Scholar. Additionally, he has co-authored more than 65 papers published in the leading physics journals, including the “Physical Review” and the “Journal of Chemical Physics,” covering such topics as electronic properties of organic materials; the statistical mechanics of polymers, particularly reacting polymers; and superconductivity. These are among the reasons Friedman has been named the 2008 “Excellence in Research” award winner. 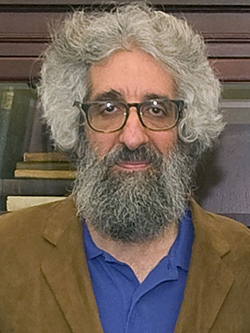 Friedman has been working in the theoretical and computational aspects of solid state physics for the last 20 years. His current research, initiated about 10 years ago, involves a computational technique known as the density matrix renormalization group. This past fall, Friedman was awarded his current National Science Foundation grant for $126,000 to study quantum Hall systems with the density matrix renormalization group. “Currently, we are trying to understand a particularly novel semiconductor system. Semiconductors are found everywhere in technology and are especially important in computers,” Friedman said. “We’re trying to understand existing experiments and make predictions for new experiments. Though not “directly applicable,” Friedman said this research has the potential for applications in the future. Friedman came to SHSU in 1989 and was granted full professorship in 2002. He earned his bachelor’s degree from Rice University in 1978 and his doctorate from the University of Illinois in 1985. Friedman said he’s “quite grateful” to receive the Excellence in Research award, following in the tradition set by his colleagues, several of whom have also worked in solid-state physics. A “role model” for both students and other faculty members, Victor Sower has become the second professor to win all three “excellence” awards after earning this year’s “Excellence in Service” award. The management professor previously won the SHSU Excellence in Teaching and Excellence in Research awards in 1996 and 2001, respectively. He was also recognized as a “Piper professor” from the Minnie Stevens Piper Foundation in 2005. Sower, whose “service” area spans three pages of his vita, “is passionately dedicated to SHSU, the College of Business Administration and its management and marketing department” and “has served, and continues to serve, SHSU at every level,” according to Pamela Zelbst, assistant professor of management. During his 18 years at SHSU, Sower has been a member or chair of more than 30 COBA committees and “has worked diligently” in COBA’s attaining and retaining of its AACSB accreditation. He has also worked on such university committees as the NCAA Certification Steering committee, the Student Recruitment and Retention Committee and has served as executive chair of the SACS-Institutional Effectiveness Committee. On the professional level, Sower serves as a “powerful mentor for our students,” said Student Advising and Mentoring Center director of academic support programs Bernice Strauss. Not only has Sower established a scholarship in memory of his father for SHSU students but also maintains a list of graduates whom he notifies of job opportunities and events that may be of interest to them. Sower's educational background includes a bachelor’s in chemistry from Virginia Polytechnic Institute, master’s in business administration from Auburn University and a doctorate in operations management from the University of North Texas. The fact that his bachelor’s degree is in chemistry and he now works as an operations management professor is one of the things he recently discussed as the SAM Center’s “Up Close and Personal” series lecturer, which was well-attended by both students and university employees, Strauss said.